For the next few years, Mary Fanning continued to spend Monday to Saturday morning living inside 14, William Street, and every weekend somewhere else; usually at one of Ireland’s beauty spots with her daughter, Mary. Mary Fanning had never revealed her wealth to anyone. Had she done so, she’d have had every beggar knocking at her door nonstop with hard-luck tales and crocodile tears. For all anyone knew, Mary Fanning was just another widow existing on a modest income, with the additional burden of a brain-damaged daughter who lived in a residential home near Waterford. The first consultant who had diagnosed little Mary with Cerebral Palsy had been spot on the mark when he reeled off the problems that her condition would throw up over the years ahead. In fact, the older young Mary grew, the more apparent it became that she suffered with a more severe type of Cerebral Palsy than first imagined. Often, Mary Fanning would have to abandon their planned weekend whenever young Mary might not be up to it. In fact, there was so much unpredictability about young Mary’s condition between one day and the next, that very few plans could be set in tablets of stone. Such uncertainty made the weekends they did spend together more special, especially as they grew fewer, the older young Mary got. Mary Fanning never wanted to risk her daughter becoming a figure of fun, not even for a moment. She never wanted her daughter to feel hurt through some stupid throw-away-comment by an unthinking Portlaw child in the heat of the moment. So, after her daughter had been placed in her residential home, shortly after initially arriving in Portlaw, Mary decided to leave her there, and not bring her back to stay at 14, William Street again on the weekends! 14 William Street was never meant to be the home of Mary Fanning and her daughter; it was Mary Fanning’s bolt hole where she’d spend every Monday to Saturday morning. It was one thing to have her neighbours know that she had a child with severe Cerebral Palsy who lived in a residential home full time, yet quite another to subject her daughter to their prying eyes and hurtful whispers behind her back. It was this fear that ensured young Mary’s mother would never risk even the smallest of slights, by allowing Portlaw gossips to gawp at young Mary when out with her mother in the village at weekend. Mary had enough money never to worry about bills again. Indeed, to secure her continued privacy, she arranged for all her communications such as rates, heating (anything and everything), to be re-directed from the General Post Sorting Office through to her solicitors in Waterford. Solicitor Mr Collings, took responsibility for overseeing all her affairs, however great or small. There was never a need for Mary to receive mail or indeed send out postage of any description. Whenever she wanted anything doing, Mary would simply pick up the phone and ask Mr Collings to take care of the matter for her. It was like having a personal manservant at one’s disposal twenty-four-seven! Although way outside the usual brief and role he ever expected to undertake when becoming a solicitor, the high retainer Mary Fanning annually paid Mr Collings amply rewarded his undivided attention and personal services supplied, far better than he could ever have hoped for. Since leaving Rory, and removing their daughter Mary from his life also, Mary Fanning was always afraid of what Rory might do were he ever to discover where they were hiding out. Mary had enough sense to know that to deny a father access to his only child always carries with it some unknown danger. Who knows how far an aggrieved parent will go to right a perceived wrong or how much being subjected to child deprivation can change a parent for the worse? Part of Mary told her that to hurt a father enough by denying him access to his only child, and ongoing knowledge of that child, has the potential to push him over the edge of reason and lead him to seek revenge. So, Mary Fanning decided to reduce every chance of ever being detected. She had often heard of private detectives going to extreme lengths, like emptying dustbins and rifling through every document and piece of paper that provided some personal detail of its owner. And while she doubted that Rory would ever possess sufficient monies to pay for a thorough search of mother and child to be professionally conducted by private detectives, Mary Fanning wasn’t prepared to take even the slimmest of chances that Rory Munt might search for her and his daughter himself. The way Mary had set matters up with her solicitor seemed to remove all such risk. Mary’s solicitor effectively acted as an in-between filter in her daily life. She had no friends or family with whom she wanted to correspond, and Mary wanted to receive no correspondence or contact in return. Consequently, there was no need for anyone other than her solicitor to be given her phone number nor any point of having any aperture in her outside door to facilitate the insertion of a letter box and all the junk mail that gets pushed through. Walk up William Street in Portlaw, and the main difference anyone would discern between Marys’ house and the frontage of every other house in William Street, was the absence of a letter box in the door of Number 14. Whenever any villager passed Mary in the village, she rarely initiated conversation, although Mary would always reply politely to any enquiries made of her, along with any questions asked by any person engaging her in small talk. Guessing that she didn’t appreciate callers to her house, it was rarely visited by anyone other than the parish priest doing his communal rounds. Overall, Mary Fanning was viewed as being a widow who preferred to keep her own company; someone who never attended village functions or socialised with this group or that. She would often be referred to in jest by some Portlaw folk as ‘The Queer Woman’. Mary had no intention of providing any reason to the Portlaw citizens that might unnecessarily invite malicious gossip; particularly in relation to her adherence to matters that identified her as being anything other than a good practising Roman Catholic. Subsequently, she would receive the routine house call from the parish priest, with whom she’d make small talk, smile copiously, and make him a cup of tea while complimenting the church gardens that led to the Parish Cemetery. Mary Fanning would also attend Sunday Mass in Portlaw whenever she didn’t take young Mary out for the weekend, as well as being seen entering the confessional box and taking Holy Communion occasionally. Any bad sins Mary had committed, and which had long remained unconfessed, she kept quiet about, and as for the ones she did acknowledge to the priest, Mary usually dressed them up to make them suitable for a young widow’s behaviour. In a roundabout way, this was Mary’s perverse response of hitting back at God for not once having come to her rescue on the many occasions she’d desperately needed Him. ​It was during the early morning of May 1st, 2015 when Mary Fanning heard a sound at the front of the house that made her jump. It was three firm knocks on her front door; rat-a-tat! The sound created surprise for Mary initially, quickly followed by a rush of anxiety. Mary initially decided to ignore the knocking, hoping the person at the other side of the door would get fed up and go away. A minute later, there as a second round of knocking; this time louder and more determined than before. She walked to her front door and opened it on the chain to see who was there. 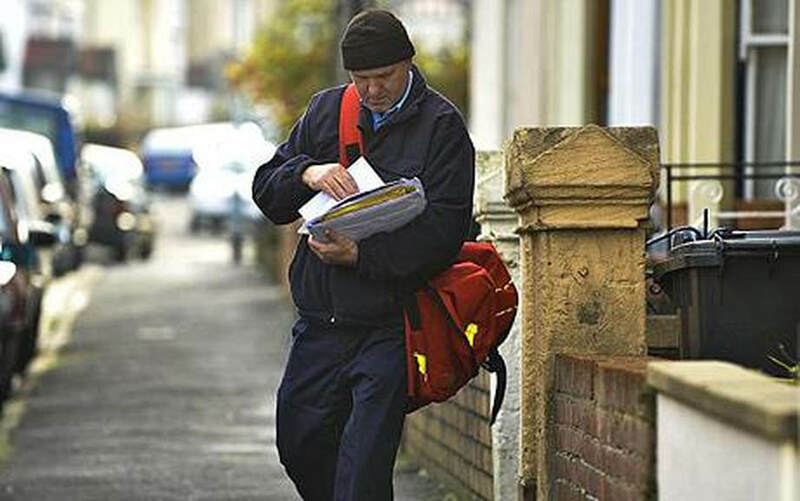 Standing on the step and holding a letter, Mary saw the postman. Mary looked aghast. For eight years since she’d lived in Portlaw, not once had any mail been delivered to her at Number 14 because of the elaborate arrangements she’d set up with her solicitor, and which Mr Collings in turn had established with the main Post Office in Waterford. “Who could the letter be from? Who outside the village knew her address?” she wondered. “Are you sure it’s a letter for me?” Mary asked. The postman smiled and said, “If you are Mary Fanning, and this is Number 14, William Street, then the letter is for you!” holding it out for her to take. Mary released the chain and opened the door. The postman handed her the letter and Mary politely replied, “Thank you.” Closing the door and chaining it once more, Mary walked back to her lounge, firmly holding the correspondence, and not knowing what to do with it. “Should I open it or phone Mr. Collings and let him open it? What shall I do?” she asked herself. At that precise moment, it started to dawn on Mary Fanning just how isolated a person she had allowed herself to become since arriving in Portlaw eight years earlier. Years of keeping to herself and rarely mixing with other Portlaw residents had made her a bit of a recluse. Indeed, whenever she thought about her life, she had to conclude that apart from planning the weekends with her daughter, nothing else seemed to interest her. She began to wonder how she’d ever allowed such a situation to come about when the mere thought of opening a letter created anxiety for her? It was true that initially she’d feared her presence being learned by Rory Munt, but surely that danger had passed long ago, she now told herself. After ten minutes of looking at the unopened letter she held in her hands, Mary Fanning took a deep breath and started to read its contents. The letter was hand-written in black ink on manila coloured paper. Not only was it a rarity today to receive any letter of communication that wasn’t typed, but to receive a written piece of personal correspondence in a distinguished style of hand that Mary could only describe as artistic, was virtually unheard of. Looking at the opened letter, the stylish manner of its construction impressed Mary. There was a sweeping embellishment in the way certain letters were penned, such as the ‘s’ the ‘t’, ‘the double p’ and the ‘m’. Such style suggested a freedom of expression and a significant confidence and boldness in the writer. Please forgive me using your baptismal and any pre-marital name to address you, but I do feel I have known you for so long now, that to address you by any other name more formal would demean the content of this letter and lessen its significance. Having left the season of spring behind us, yet not having fully entered that of summer, reminds me that is how I’ve felt about you for so long now. The best way I can explain it, Mary Fanning, is that for over thirty years, I have lived an in-between existence, with one foot in the past and one in the present. Constantly being out of step between what I have always wanted to do, yet dare not, has essentially kept me emotionally trapped between two time-zones and has prevented me moving on with my life in the manner I want and need to. Put briefly, Mary Fanning, you were a significant part of my past and have only recently become a part of my present, since I learned of your current whereabouts. My wish, Mary, is to include you in my future, not in any physical or romantic way, but to know you as I once knew you many years ago, as the dearest of friends. I know I run the risk of you not remembering me, Mary, but at a time in my life when I most needed it, you were the only one who was there for me. I can be found any Saturday afternoon in ‘Slade’s Coffee Bar’ near the Tower Clock on Waterford Quay between 1.00 pm and 2.30 pm. Should you wish to renew an old contact, I would dearly love to see you again.